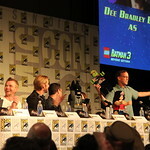 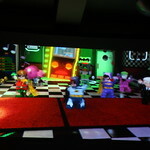 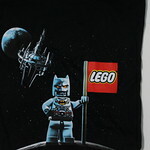 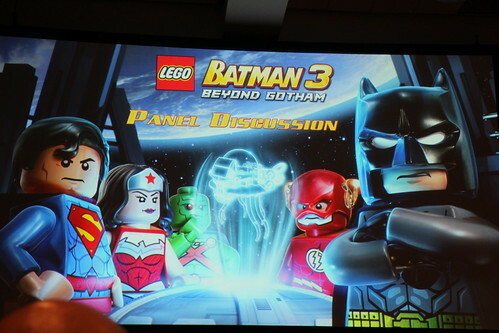 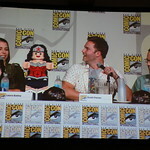 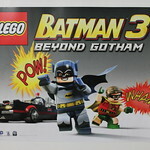 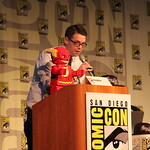 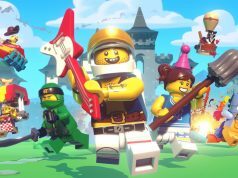 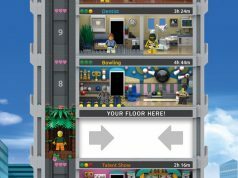 On the last day of San Diego Comic Con 2014, the LEGO Batman 3: Beyond Gotham panel was hosted by IGN’s Greg Miller and there were some surprises. 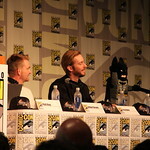 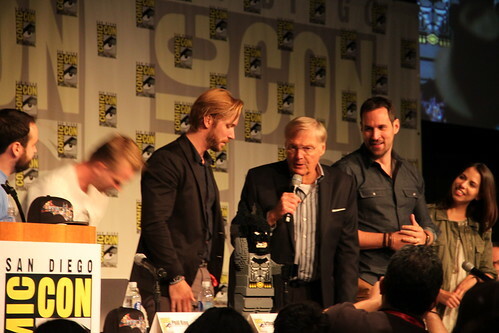 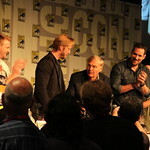 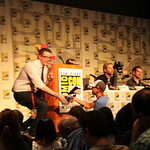 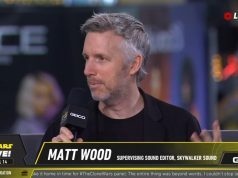 TT Games’ Phil Ring and Arthur Parsons was on hand as well as some of the voice actors of the video game including Troy Baker, Travis Willingham, Laura Bailey, Scott Porter, Dee Bradley Baker, and Josh Keaton. 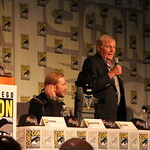 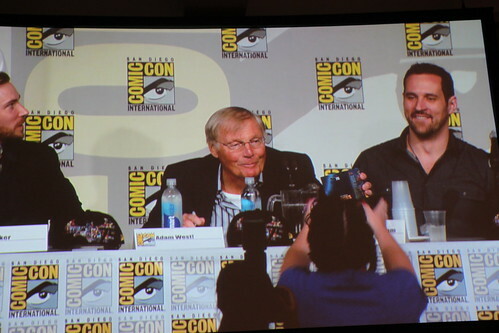 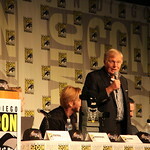 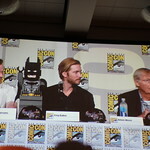 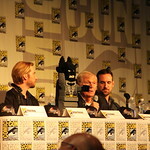 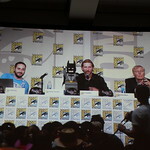 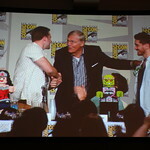 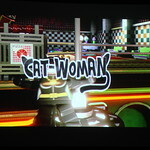 One surprise that wasn’t really a surprise was that Adam West was also on the panel. 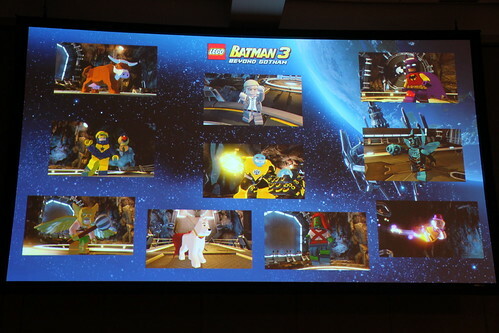 During the panel, they did a recap of the new playable characters such as Bat-Cow, Booster Gold & Skeets, Hawkman, Adam West, Arkillo, Krypto, Miss Martian, Batman of Zur-En-Arrh, Blue Beetle, and Mr. Mxyzptlk. 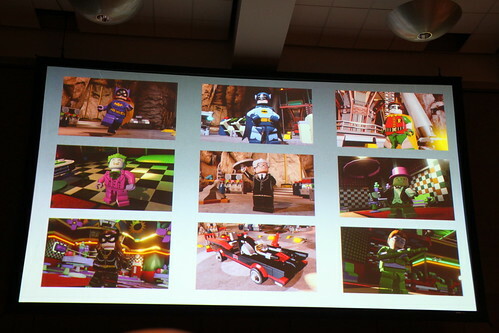 These characters were announced at the LEGO booth during SDCC by Arthur Parsons. 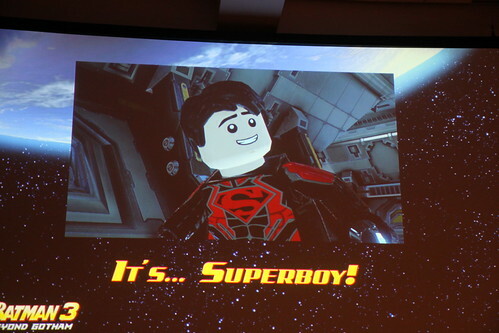 Something new that was shown was Superboy’s outfit which is the New 52 version. 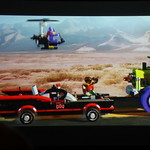 The other thing that was new was the 1960’s versions of the Batman charcters like Robin, Catwoman, Batgirl, Joker, Riddler, Penguin, Alfred, and the Batmobile. 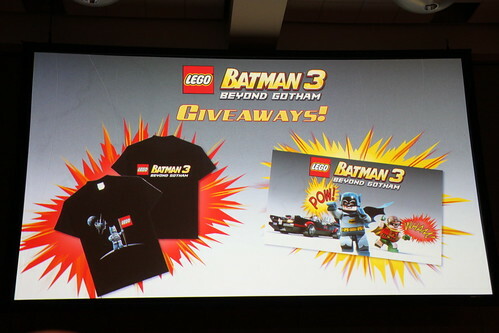 Some surprises were the LEGO Batman 3 t-shirts and posters that were given away to everyone in attendance. 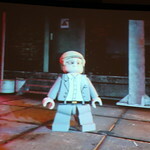 You were given a ticket to bring to the Fulfillment Room at the Hyatt to pick up your items. 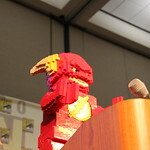 The only problem was that it was kinda hot walking outside from the convention center to the hotel. 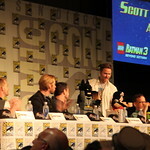 The other surprise was for 3 people who asked questions at the panel. 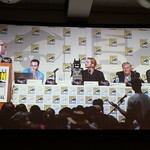 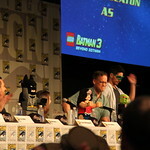 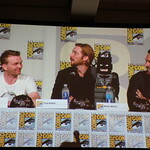 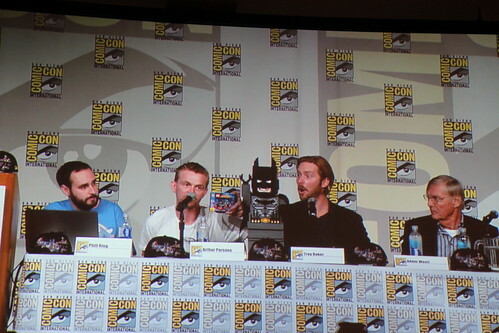 Greg Miller had 3 of the LEGO SDCC 2014 Batmobile exclusive sets for people who had the best questions. 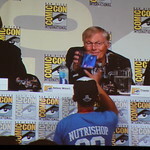 Not only did those people get the sets, it was also signed by Adam West. 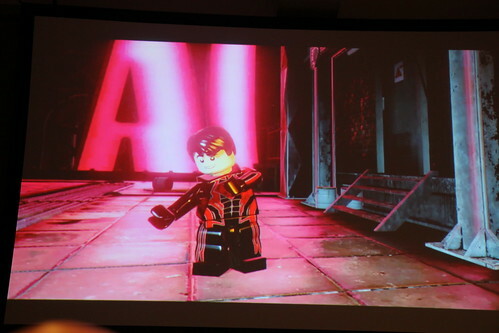 Overall in my opinion, the panel was pretty cool, but it wasn’t as cool as last year’s panel for the LEGO Marvel Super Heroes video game because there weren’t as many surprises. 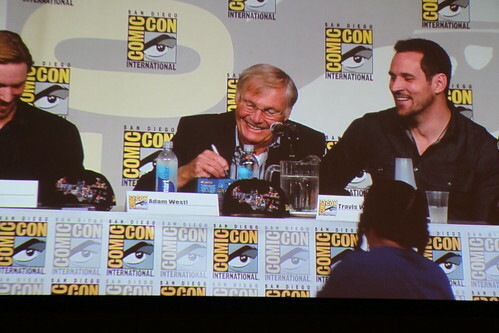 In this panel, we already knew that Adam West was coming but we didn’t know Stan Lee was going to be showing up last year. 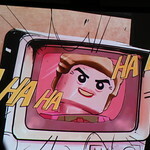 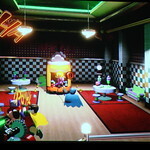 Also the new character reveals was already done at the LEGO booth so I’ve already seen them before coming to the panel. 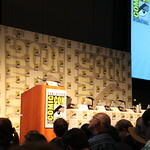 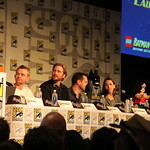 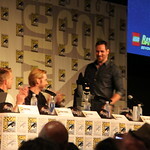 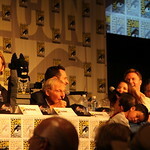 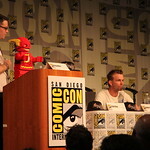 Check out the pictures I took from the panel below.